Well, the site has been down for quite a while as I fell behind in keeping the CMS up to date and as a result my host shut it down until I could upgrade it. Turns it was more of a migration to the new version than a update and it was not a pretty thing to do, but it is done. I hope to make the site look less "vanilla" in the coming weeks, but for now I'm just happy to have the site back. How Am I Going To Make It Up To Mr. Rhombus? Karrie and are often amused at the traits each of us have that Brady and Lucas seem to have picked up/inherited. For example, Lucas sleeps exactly like I do, on his side with his hand under his face. Brady rubs his feet against our legs when we lay in bed with him to read a book, just like Karrie does to me when we lay in bed. We have noticed several things along the same lines over the years; sometimes it is a Lucas/Mike trait, sometimes Brady/Mike, sometimes Lucas/Karrie and other times Brady/Karrie. Recently we encountered one that was pretty hilarious, but it requires some background first. Many years ago when Karrie and I were dating Def Leppard's "Pour Some Sugar On Me" came on the radio as we were driving. After a couple verses it was clear to me that Karrie was singing the wrong lyrics. After some discussion she told me that she thought the words were (and she had been singing for years) "Awesome sugar honey" instead of "Pour some sugar on me." Since that day, after I straightened her out, whenever this song comes on and we are both present it results in much laughter from us both. This ability to sing the incorrect lyrics without shame is the trait we are discussing here. So the other day Karrie and the boys were listening to Music Choice on the TV downstairs and the Bastille song, "Pompeii" came on. Brady, who loves to sing just about any song, was singing when Karrie noticed a slight discrepancy. Instead of singing the correct lyric of "How am I gonna be an optimist about this? ", Brady was singing (confidently too), "How am I gonna make it up to Mr. Rhombus?". It was the source of great amusement for all of us and Brady took it all in stride. This year we decided we would spend a week at the beach for our vacation. We considered what beaches might interest us. Maryland and Delaware beaches, while closest, are too crowded for my liking. Four years ago we joined friends on their vacation to Top Sail Island, NC and we liked that area a lot. Earlier this year Brady's basketball coach and father of one of Brady's classmates recommended Emerald Isle, NC. They have been going there just about yearly for their family vacation and spoke very highly of it. Karrie began investigating, found some nice units we could rent and lots of activities in the area in case of weather and so she booked us a rental unit right on the beach. Since we booked a little less than three weeks before our arrival we got a pretty good break on the price as well. The trip down was relatively uneventful and took about 8 hours with a couple of stops for food and bathroom breaks. The boys were awesome and entertained themselves the entire trip. Once we arrived on the island we went to the rental management office, got the keys and then headed to the unit to check it out. Based on the pictures I'd seen online the unit looked awesome and once we had a look around we were not disappointed. With two bedrooms, two baths, washer and dryer and full kitchen it had everything we needed. The master bath even had a jacuzzi tub which the boys took advantage of for baths. 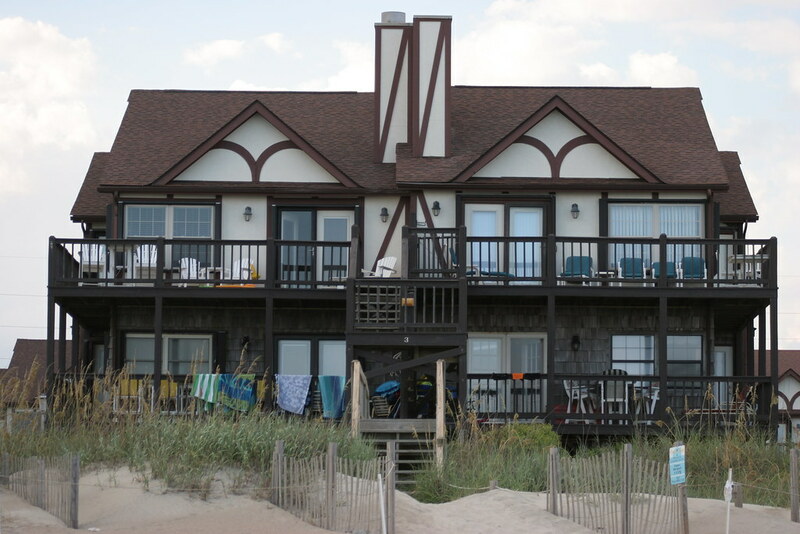 The unit also had a nice deck with furniture including high chairs we could use to look out over the beach. On a scale of 1 to 10 I would rate our unit a 7 or 8. After we checked out the unit we headed out to grab a bit to eat for dinner then off to the grocery store to buy food for the week. Remarkably there wasn't a chain restaurant anywhere on the island but the few times we did eat out were hit and miss. We spent the majority of our time during the week between the beach and the pool. The family that recommended Emerald Isle to us were coincidentally vacationing there during the same week we were and the invited us to a pirate cruise in a town a short drive away in the middle of the week. 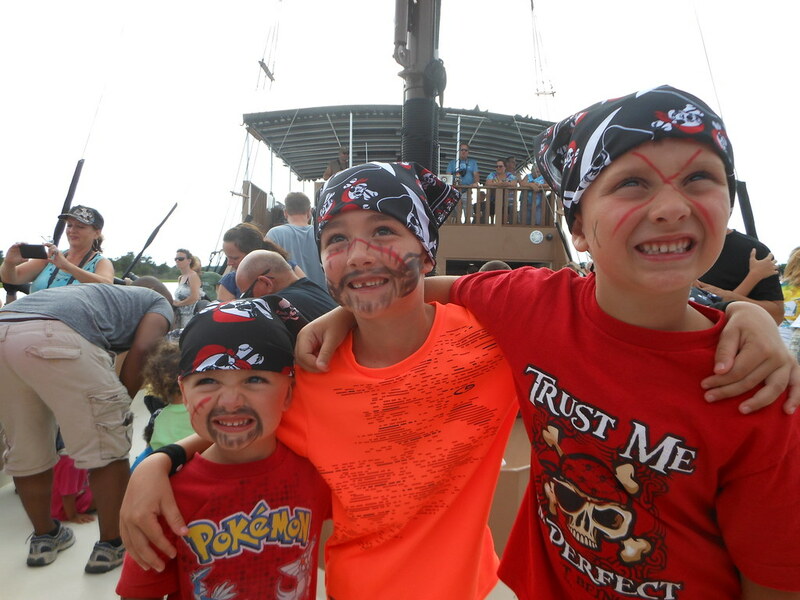 The boys had a great time dressing up as pirates, firing the water cannons, swabbing the deck, sword fighting and a boat-to-boat battle with Black Beard for his treasure. Our other excursions included seeingTurbo at the movie theater and a round of miniature golf. While at the beach Brady made a new friend with one of rental neighbors named Mr. Bill. Mr. Bill could be found fishing off the beach in front of our rental every morning and evening and was kind enough to offer Brady a chance to fish using his equipment. 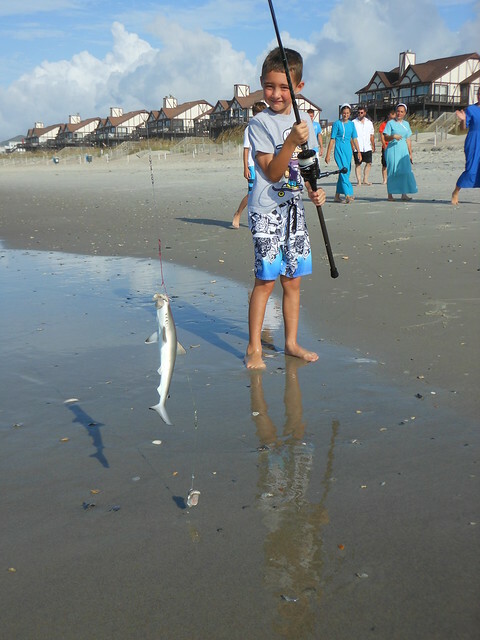 It took us a couple of days to make that happen, but when it did I think it was the highlight of Brady's vacation as Brady managed to catch not one, but two small sand sharks. Overall it was a great vacation for us all, even Lucas who seemed ready to be done with it and back home on Thursday, 3 days before our trip was end. We are likely to vacation at Emerald Isle again and would highly recommend it to any of our friends looking for a family beach to vacation where you don't have to step on people's toes to walk to the water. On the bike, that is; that is my goal for 2014. In 2011 I rode/trained my way into the best shape of my post military life at 180lbs, a top-10 in my first road race in decades and racing into the top half of my cyclocross races. Unfortunately my cyclocross season was marred with wrecks and injuries and I didn't realize the full potential of my training. Moreover, the 5500 miles on the bike (Jan-Oct) was a strain on my family and as a result I cut back in 2012 with ~2400 miles and no training whatsoever. 2013 was even more dismal for my cycling with less than 1200 miles as I really focused on my boys and it was difficult to pull myself away from them to get out on the bike. On January 1, 2014 my body also reported to me that it was now devoid of whatever cardiovascular fitness I once thought I possessed. A 25 mile ride with 1760 feet of climbing took 1hr 52min, or 13.6mph average, which by all accounts is pretty pitiful. So my plan is to ride/train six hours a week without a major impact on my family. To do this I will work nine hour days, three days a week. The remaining two work days will be 6.5 hours, allowing me to get home and ride for 1.5 hours each day before my kids get home from school. The remaining three hours of riding will come via a long ride on the weekend. In addition to riding, I also plan to incorporate some weight training to help build some much needed muscle. No doubt this plan of attack will be challenging. For the moment I plan to simply do easy rides, then ramp up the intensity come late March or April, relearning how to suffer and like it. Hopefully I will document my successes and challenges here along with my progress. Yesterday my family and I made the trip to Arlington National Cemetery to observe Memorial Day and honor the more than one million men and women who paid the ultimate sacrifice in the service our great nation. The traffic in and out was dreadful, mostly due to road closures for Rolling Thunder Run, but in the end it was something I felt we needed to do and I'm glad we went. The plan was to watch the Changing of the Guard at the Tomb of the Unknowns and then visit the grave sites of a lost friend and a few others that were buried there this year. The Changing of the Guard ceremony is really something you have to see to appreciate and The Old Guard does an outstanding and impeccable job of fulfilling this duty. Moreover, The Old Guard also places flags in front of the more than 260,000 graves at Arlington just before Memorial Day which really makes for a spectacular show of patriotism to those visiting the cemetery. We then visited the grave of my friend Msgt. Ronald Geza Katona who passed away in 2004, just 19 days shy of his 43rd birthday. While I'd never served in the same unit with Ron, I'd known him for years having met at an autocross being held at Ft. Meade where we were both stationed. Ron was epitome of the nice guy, always looking to extend a helping hand to the new guy and get them hooked on this sport that he loved so much. I was pleased to see that others had been to visit with him recently as evidenced by the stones left on his headstone, typically a Jewish ritual. I will never forget Ron and as long as I live in this area I will make every effort to visit and pay my respects to him yearly. I had intended to visit the burial sites of several other young Americans who died and were laid to rest this year and to that end had researched their stories some before the weekend. My plan was to utilize the cemetery's smart phone app, ANC Explorer, to find the sites of these individuals once we arrived at the cemetery. Unfortunately, this app was cumbersome and not very helpful in finding any of the burial sites for the individuals I had intended to visit. I have written a little bit about each of them below and will endeavor to plan better next year and pay my respects to them. Capt. Cullen was born and raised in Eldersburg, MD which is were my family and I currently call home. She was a graduate of Liberty High School and West Point and was trained as a Black Hawk helicopter pilot. She and her crew or four perished on March 4, 2013 when their Black Hawk crashed during a training mission near Kandahar, Afghanistan. Capt. Cullen was 27 years old. Sgt. Wittman was the first U.S. combat casualty of 2013. He was a decorated veteran on his second combat deployment to Afghanistan and had earned a Purple Heart and Bronze Star during his service. On January 10th while on mounted patrol, his unit was attacked with small arms fire and Sgt. Wittman died of his injuries; he was 28 years old. Capt. Steele was killed April 3rd when his F-16 fighter crashed near Baghram Airfield in Afghanistan; he was 29 years old. Chief Shadle was a decorated combat veteran with several decorations including two Bronze Star Medals of Valor. Chief Shadle leaves behind a wife and two young children. He died in a training accident on March 28, just 11 days after his 31st birthday. Capt. Pedersen-Keel, of Miami, FL was one of two soldiers killed on March 11th when an Afghan police officer opened fire inside a police station in Wardak province, Afghanistan. Capt. Pedersen was 28 years old. That is just a handful of the stories out there of military members that paid the ultimate price this year alone. On this Memorial Day, and every day, let us not forget the sacrifices made by our military members and their families in the name of freedom. My attempt at talking politics.